family home. We offer our guests three well appointed ensuite shower rooms with their own sitting room/dining room and front door. Our traditional stone house is tucked away down a quiet lane next to the village Church. 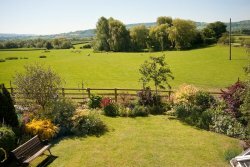 The pretty garden looks across meadowland (and the sheep) to the Cotswold Hills. You're welcome to enjoy a pot of tea in the conservatory, garden, summerhouse, or in the lounge by the fire when it is colder, and we have plenty of information to help you plan days out. 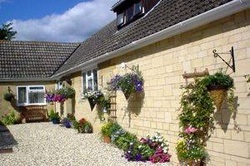 Situated in Gretton Fields near Alderton, Elms Farm offers accommodation with free WiFi and a garden. The bed and breakfast offers a flat-screen TV and a private bathroom with free toiletries, a hair dryer and shower. A fridge and kettle are also featured. Guests at Elms Farm offers a full English Breakfast. The accommodation offers a sun terrace and guests can relax in the shared lounge area. Cider Mill Cottage is a traditional black and white Grade II listed property dating back to the 16th Century. It has many period features including exposed beams, inglenook fireplace, leaded-light windows and thatched roof. Beautifully refurbished, Cider Mill Cottage offers all the modern conveniences you could wish for with interiors that are a perfect blend of rustic charm and modern comfort. School View is a terraced cottage with two bedrooms, made up of a double and a four-foot double. Also inside there's a kitchen, a living/dining room with a woodburning stove and a family bathroom. To the outside there is off road parking and a rear enclosed garden with lawn and patio areas which has furniture, barbecue and a summerhouse. School View is a well-placed cottage to be enjoyed with your loved ones all-year-round.